They were all around you. Their wicked eyes are watching you 24/7 ready to attack you. 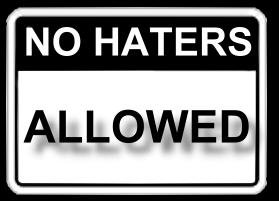 Haters are NEVER ALLOWED on my life. They actually have no right at all to invade and ruin my HAPPINESS. Yes, they can pissed me off for a minute or an hour or a day and that’s it! I will laugh at it the next day. Haters will not be the reason to make me look aged with full of wrinkles on my face, NO WAY! Haters can say whatever they wanted to say to me and make stories so I can be crowned as the hideous person in the world and I own a seat beside the devil. Who cares? no one care except for YOU. It is your own insecurities at all. Haters are born because of jealousy, envy, insecurities and their own ghost. If you let them live and over power your life..oh..you’re dead! Do you really wanna be depress while they win and laugh seeing you on that place where they wanted and intended to put you? Well me, I will never allow that. I am that kind of person who is absolutely a GOOD friend but your WORST enemy. I mean, I can be your perfect friend if you are to me and if you treat me well but then if you’re a major back stabber and you tell people that you do not like me,the big question is ” DO I LIKE YOU? ” and then a big laugh from me. No space for you baby! I will never waste my time for haters. I will never give my Happiness for haters they are not worthy. They might think that their words will cut our life apart, I can tell you NO YOU CAN’T. It might bring scratch however its just a scratch not a big deal after all..
Just a bit of precious and useful advice for the HATERS.”Life is too short”never waste it hating other make your life productive rather than minding others business. Jealousy will kill you and insecurities will not make your life easy, It will just make you feel miserable. Why not make your life exciting on the right manner not bullying or whatever you want to do. You are just filling your heart with negatives which is not good for your life. Why not fill it with peace and calm and happiness not stupidity. You will die in jealousy and negativity and we well live happy cause we don”t bring negative to our life. So for those who have haters in their life, don’t mind them at all. Never waste a single effort and time entertaining them. If someone tell you you are an ugly monster walking like a duck, just ignore them or smile at them. What can beat an ugly comment than letting them know that you don’t care to what they say. There’s a lot of people who loves you and haters is not a great loss in your life. Justsmile …. smile … smile … never surrender your HAPPINESS.